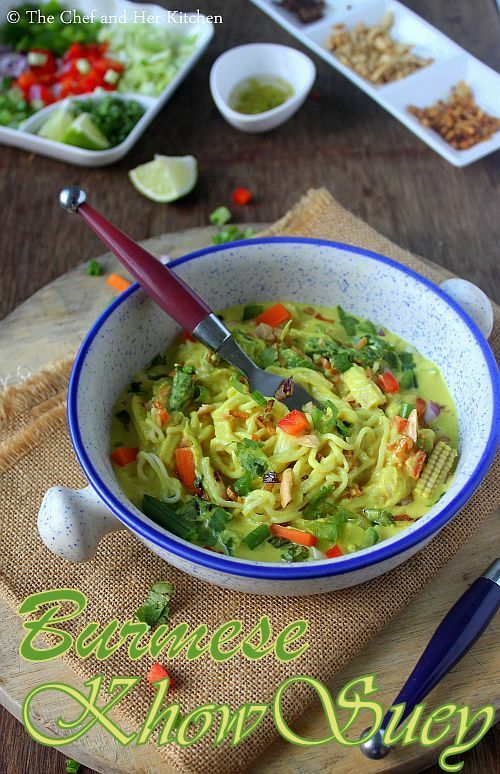 Vegetarian Burmese Khowsuey Recipe with step by step photos.Sometimes we fall in love with few dishes at the very first bite and this Burmese Khow suey was one such dish for me which bowled me for the very first time I had tried in a restaurant back in Mumbai long time ago.When ever I visit that restaurant it had become a norm to order this dish for me with out any fail.Mildly spiced gravy poured over a bed of noodles and is topped with various condiments which adds a nice texture in each and every bite.The crunchy bits of fried garlic, onion and crushed roasted peanuts need a special mention as I just love them in my toppings and I always add them generously to jazz up my khowsuey bowl. I wanted to recreate this restaurant magic at home so that I can pep up my weekend meals a bit and got referred to this recipe while I was searching for the recipe and I modified the recipe a bit to suit my convenience and I must admit that it turned out really delicious. 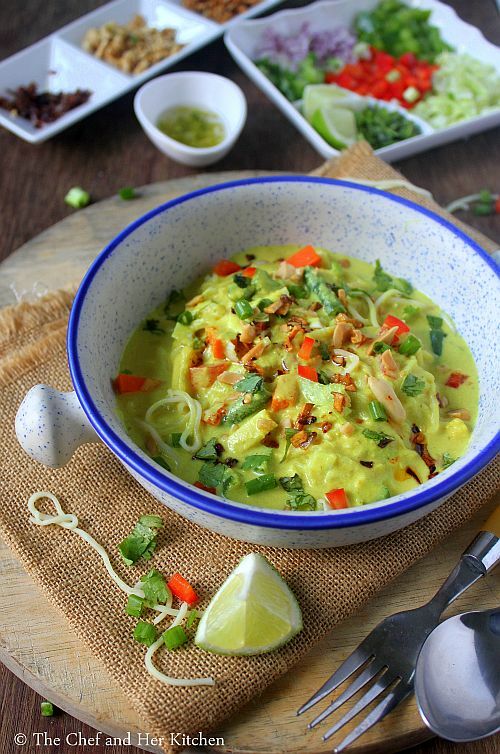 This has become quite regular at home as the idea of making your own khow suey bowls from an elaborate spread of condiments and toppings is much appreciated by everyone at home and also it is fun to create your own khowsuey bowls according to your taste buds. Before I jump into the recipe I am warning you - do not get worried seeing the number of ingredients and the long procedure I had mentioned, it is actually quite simple to make. 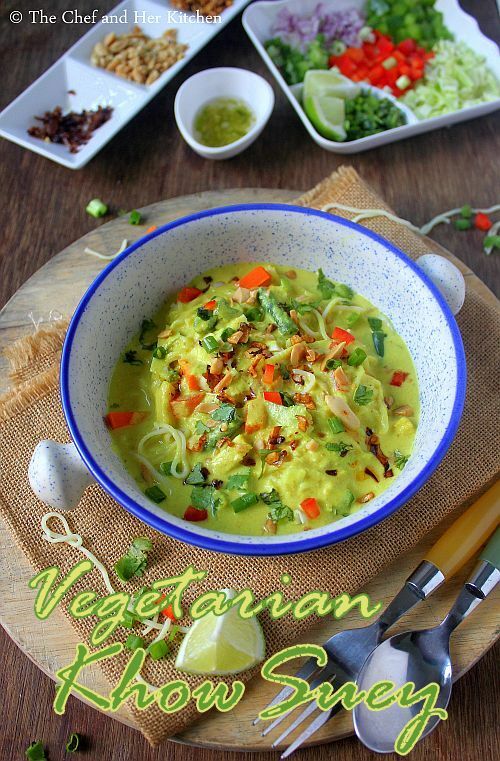 It is easier to make than the regular Chinese Veg Hakka Noodles with manchurian or your usual roti-sabzi-dal fare. Just that you need to chop a lot of vegetables and deep fry a few things for toppings which you can do prior hand. This is one such dish which can wow your guests for sure if you serve at your parties.So, what else you are waiting for? try this recipe at home to impress your family or friends and enjoy the whole hearty meal at home. 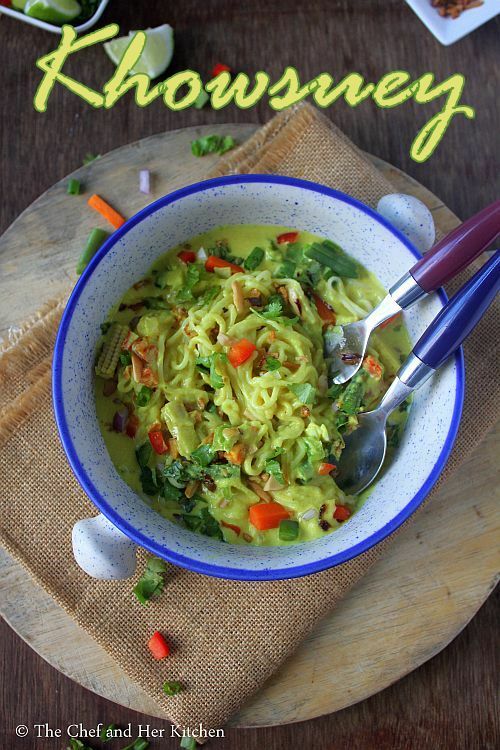 Check out other noodle based recipes in my blog - Chinese Veg Hakka Noodles and Schezwan Vegetable Noodles. Boil Noodles as per the instructions on the pack and keep it ready. Dry roast chickpea flour until it becomes aromatic and keep it ready. 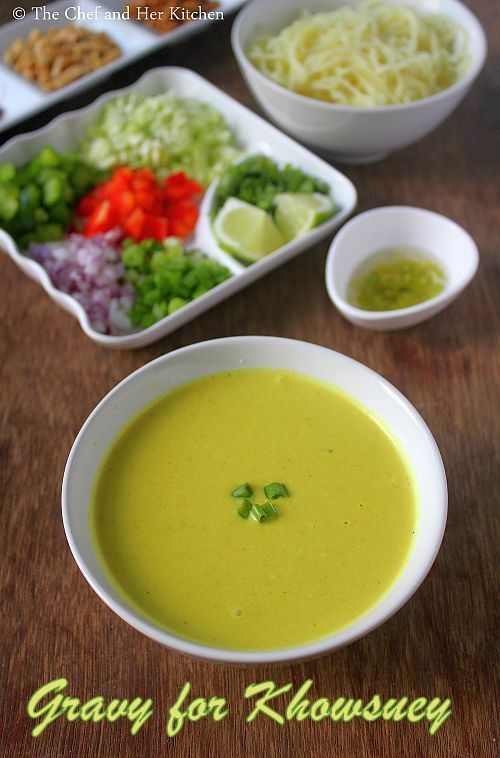 Blanch the vegetables - babycorn,carrot,beans in hot water individually until they are slightly soft but still maintain their crunch.If you are using other vegetables like cauliflower, broccoli,corn or peas blanch them accordingly too. Grind the ingredients mentioned under the section- for paste - onion, ginger,coriander seeds, garlic , turmeric powder and lemon grass stalk( I used green thai curry paste as I did not have lemon grass in hand) to a fine paste. In a big pot/kadai heat oil and then add ground paste and fry until the mixture leaves the oil at the edges.Add roasted chickpea flour and fry nicely until it is mixed. Now reduce the flame and add the stock slowly and keep mixing it with the whisk nicely to avoid the lump formation. If you want to add vegetables to the gravy, you can add them at this stage and let them cook in the gravy,but I like to keep it separate to maintain their crunch. Add salt and pepper powder to it and let the mixture come to a boil and then add coconut milk and mix it nicely and let it come to boil.Add more water if needed to get the consistency of a gravy which is neither thin nor very thick.Cover and keep it aside. Deep fry finely chopped garlic and onion separately until they turn brown and crisp. Finely chop green chilies and soak in vinegar, it is better to let it soak for long as it makes the green chili bits spicy and tangy. Keep all the toppings,noodles and gravy ready. 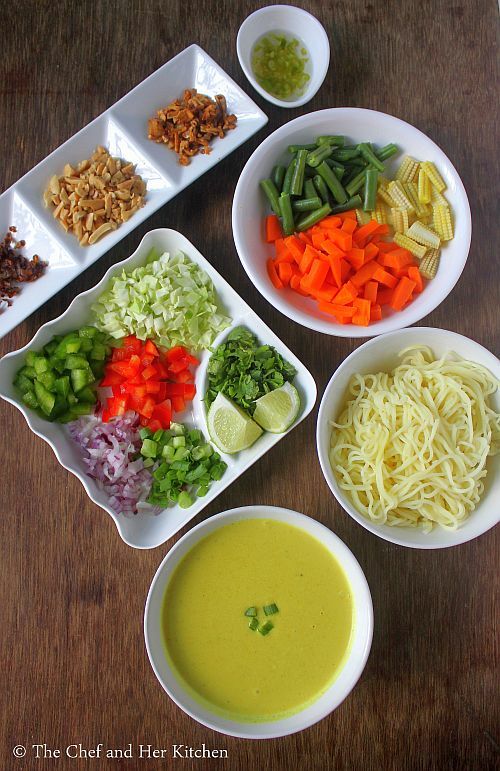 for each portion of khowsuey - Place a portion of boiled noodles in a serving deep bowl and add few blanched vegetables(babycorn,carrot and beans) and also add finely chopped raw vegetables (cabbage,green and red capsicum,onion) and pour 2-3 ladles of hot gravy all over the noodles and vegetables.Now garnish with a generous amounts of deep fried garlic-onion bites, crushed roasted peanuts, spring onions, chili flakes, green chilies(soaked in vinegar), coriander, deep fried noodles(if using) and squeeze lemon all over it.You can add pan fried tofu cubes or boiled egg wedges on top while serving if you want. 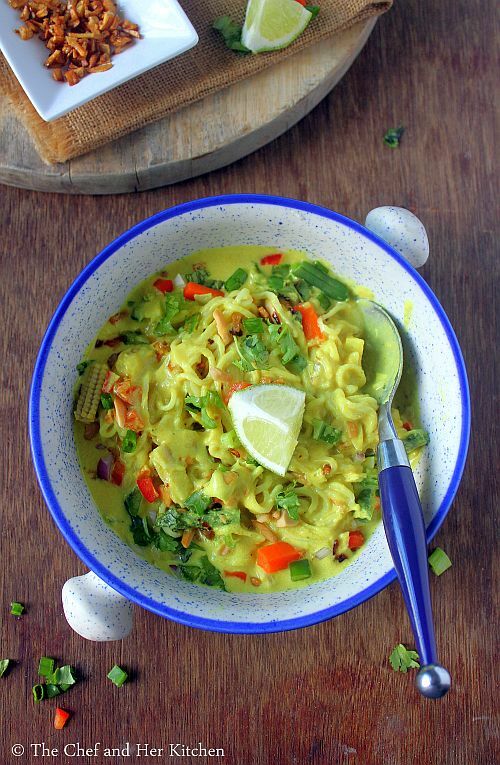 Repeat for all the portions.Add the noodles,gravy,vegetables,toppings quantities as per your wish. You can add vegetables while preparing the gravy but I prefer to keep it separate and serve them so that it maintains its crunch and we can add them as per our wish. Be generous with toppings- fried garlic, fried onions, crushed peanuts. They add nice taste to khowsuey. You can even add glass noodles or rice noodles or a combination of noodles,but I use regular noodles. 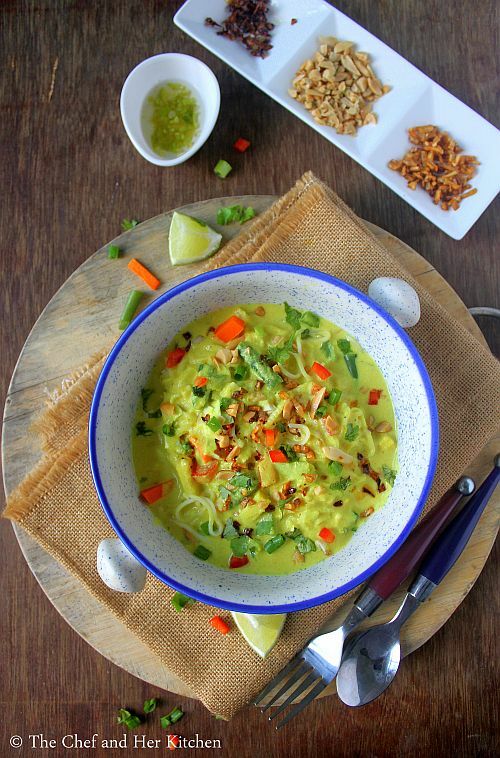 It is fun to serve everything at the dinner table so that one can create their own khowsuey bowls as per their taste.Hence keep everything ready and heat the gravy just before serving. I did not have lemon grass in hand and hence I added Thai green curry paste which had good amount of lemon grass in it and it was quite good. Hi recipe looks great. I never heard of this recipe in us. I have a quick question are you using began just for thickness or is it a must? If it is for thickness can we add cornflour?